Leaving behind the many scenes of conflict, and the important but seemingly endless stream of elections among the 190 some countries of the world, let's look at an infrastructure project. 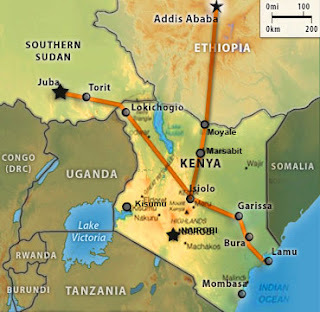 In East Africa, we read that South Sudan, Ethopia and Kenya have agreed on a pipeline venture which would transport oil from South Sudan's current oil fields and Ethiopia's potential finds across Kenya's arid lands to a port - to be built - in Lamu. If that sounds complicated and full of risks, it is. The big picture, South Sudan wants an alternative route to export its oil. Landlocked Ethiopia is exploring for oil in its southern regions and also wants a route out for any successful oil fields. 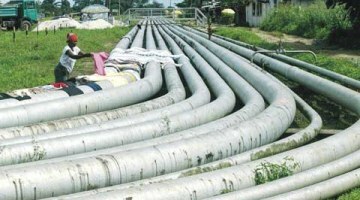 On the other hand, a new oil route would give South Sudan leverage in dealing with The Republic of Sudan, which holds the current set of pipelines through which South Sudan exports oil for badly needed funds. Such a partnership could foster closer ties between Kenya and its neighbors, and in general terms, any regional cooperative infrastructure project between nations could be considered a stitch for improving the well being of its citizens and honest governance. But of course, this is oil. In so many developing countries, exporting oil has not improved the lot of the ordinary wananchi but has certainly enriched elites, and furthered corruption. Then there are the environmental risks. 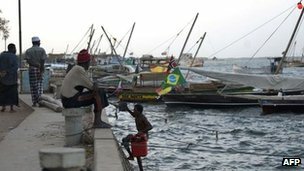 Lamu, the intended port, has until now existed as a quiet fishing village with a bit of a tourist market. Anything becoming a boom town tends to lose some of its quieter qualities, along with oil as a commodity that can leak, spill, and otherwise degrade a local environment. On the other hand, quiet poverty has its own issues. Kenyan President Mwai Kibaki, Ethiopian Prime Minister Meles Zenawi and South Sudan's President Salva Kiir witnessed Friday, March 2, the launch of Lamu project which will give landlocked Ethiopia and South Sudan maritime access to export products and import others. The $24.5 billion project in Kenya's port on the Ocean Indian includes a pipeline, oil refinery and road network as well as railways line to Juba. Ethiopia is eager to partner with this project regardless of the probability of new oil finds. While we've focused on the oil component which is a driver for South Sudan, Ethiopia's Prime Minister Meles Zenawi expressed interest in a new modern road and rail connection to the Indian Ocean port that could bolster imports and exports of trade goods. The project certainly looks good ... in color and on paper. Kenya's President Mwai Kibaki (R) and Ethiopian Prime Minister Meles Zenawi arrive for the signing of bilateral agreements between the two countries at the State House in Nairobi, March 1, 2012. For South Sudan, the project presents an opportunity to end dependency on oil pipelines and infrastructure of neighboring Sudan. South Sudan's government suspended oil production after accusing Khartoum of stealing the oil as talks on the transit fees failed to reach an agreement. Speaking at the launch ceremony, Mayadrit said "for South Sudan, it is a vision to long-term security. The backbone of our infrastructure that will allow us to end our reliance on oil extraction. It is a vision whereby in the future you will be able to board people and freight cargo in the morning in Juba and be in Lamu that same afternoon," he added enthusiastically. 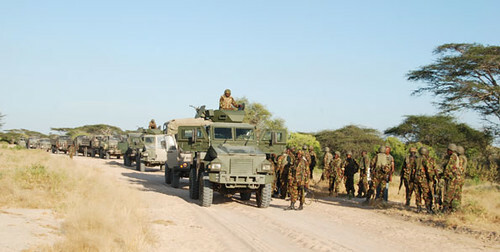 Let's keep in mind the late 2011 incursion by Kenyan forces into Somalia. With a famine in progress, Al-Shabaab presiding over an anarchic situation, and one of the world's largest refugee camps growing on Kenyan soil, there were legitimate arguments for Kenya saying "enough." But we might consider that a proposed pipeline project and its security needs may also have played into the decision. South Sudan can't be happy. It seems a pipeline could be a magnet for two things. One: terrorist groups hiding out in Somalia looking for something to destroy. But two: foreign investment AND protection. Could be a chance to help stabilize the region.